This issue of Cardiac Electrophysiology Clinics, edited by Drs. Pramod Deshmukh and Kenneth A. Ellenbogen, will focus on His Bundle Pacing. 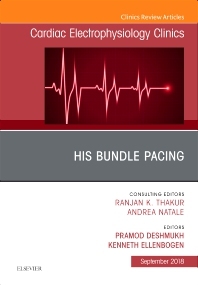 Topics include, but are not limited to, Bundle of His – A contemporary reappraisal, Electrophysiology of bundle branch block, Pacing-induced cardiomyopathy, Tricuspid valve dysfunction caused by RV leads, His Bundle Pacing – concept to reality, How to perform HBP - Tools and techniques, Electro-anatomical atlas of HBP (LAO/RAO views & recorded Egms), Hemodynamics of His bundle pacing in comparison Apical & Septal pacing, HBP for cardiac resynchronization, Long-term results of HBP, Getting on the curve – learning HBP, HBP in conjunction with AV node ablation in AF, and Ongoing clinical trials and future developments.